The game on Sunday, April 19 is a continuation of the 1644 English Civil War campaign we ran last year. Operations in that game climaxed with the Royalist siege of Reading, which was raised by a Parliamentarian relief army led by the Earl of Essex and Sir William Waller. These two generals had put aside their differences to combine to save Reading, but old rivalries persisted and these, plus a strained logistical situation, caused their armies to separate following the battle. Their victory did nevertheless permit some significant advances against the weakened Royalists. Essex pursued the King into the West Country, taking a number of towns, whilst Waller invested the major Royalist garrison of Banbury. When this scenario commences, Waller has just taken Banbury after an arduous siege. Although this operation has taken a toll on Waller’s men, they have secured a major prize, which has further isolated the King’s capital at Oxford from the bulk of the areas he controls. King Charles pulled back west to avoid being trapped in Oxford, whilst attempting to protect his recruiting grounds in Somerset, Devon and Cornwall. He has reorganised his field army, incorporating the forces of his nephew Prince Maurice. All is not lost for the Royalists however. Two weeks ago, Prince Rupert won a stunning victory at Marston Moor, just outside York. In this rout, he largely destroyed the northern Parliamentarian forces, and severely weakened their Scots allies. Having left small forces to mop-up resistance in Yorkshire, he has moved S to Newark with part of his victorious army. Rupert was always confident, but has this latest triumph gone to his head? From his position at Newark, he threatens advances into the Midlands, the rich Eastern Association, or even London. This is especially dangerous, as the Parliamentarians has previously depleted the forces of the Eastern Association to reinforce Essex before the key battle at Reading. This led to the Eastern Association commander resigning his commission in disgust. In this hour of danger, the noble Earl of Manchester has been prevailed upon to resume command, and substantial aid has been promised to allow him to rebuild his army. Our next game is in just under 3 weeks. This one is a continuation of last years ECW 1644 campaign. For more details see the head of this thread. Please note that because the village hall was double-booked for our May game, this will be the last face-to-face k/spiel before September. A reminder that our next face-to-face k/spiel at Little Gaddesden is in just over a week’s time. This is an ECW campaign set in 1644. For more details see the head of this thread. In summary, Prince Rupert’s recent triumph at Marston Moor, appears to have secured the North for the King, and has created an interesting strategic situation in southern England. I will try an accommodate any preferences for Royalist, Parliament, Umpire, if you let me know in advance. As previously mentioned, the next face-to-face k/spiel game is on Sunday 19th April, starting at the usual time of 11 am, at the Little Gaddesden Village Hall. How will the game be run? We will use weekly turns. Apart from that it will operate much like the usual kriegsspiel. Players will normally represent various army commanders, and will therefore typically be some distance apart. Each player will give his orders for the coming week to the umpires, who make all necessary moves on the umpire map, before feeding the results back at the end of the turn. The aim is to complete each turn in 10-15 minutes, and get through three to four months of a campaign. If a major battle takes place, this will be resolved using a ’30-minute battle module’ and all players will step away from their normal responsibilities, to take part as subordinates of whichever player commands the force involved. How are my forces made up? Your army is composed of foot (infantry) and horse (cavalry). Rather than distinguishing between pike-men and musketeers, we are regarding your foot as a mixture of the two. Similarly, your horse actually includes a small number of dragoons, but for the purposes of this game we are not dealing with these as a separate combat arm. In addition you will also have field artillery and, more rarely, heavy siege artillery. Whilst the troops in the main armies will march anywhere, those in the smaller regional forces are mainly local men, and their leaders are local bigwigs, who have enlisted to protect their homes. Some of them will leave their garrisons if so ordered, but won't go very far, and will expect to return to them when the operation is complete. How fast can I move? With frequent rest days, your foot will normally march no more than 3 towns on the map in a weekly turn, even on the best roads, and in good weather. A purely mounted force can move somewhat faster for a short period, but will be unable to fight effectively if the horses are pushed too hard. Heavy siege artillery can normally only move 2 towns per week. In periods of poor weather you will move more slowly. Only the primary and secondary roads are marked on the map. You can leave these using more minor roads, but will move much more slowly. Large rivers can only be crossed easily at bridges, and even then this may take a day or more, depending on the size of your force. In the ECW, both King and Parliament established a form of taxation in order to support their new armies. Actually levying the tax was always difficult, but it was important to control a wide area to maximize your chances. For this reason, some horse were always included in the garrisons. The taxes were levied in cash, food and other materials, but for simplicity we will assume that cash denominated in ‘£’ are the currency of our game. Each turn the umpires will tell you how successful you have been in raising cash, and how much you currently have. The Royalists were very dependent on raising cash from the towns they garrisoned, and the surrounding area. The main Parliamentarian armies were largely financed by periodic remittances of cash from SE counties and particularly the City of London, a major backer of the Parliamentary cause. The Committee of Both Kingdoms (CBK) administered this process. 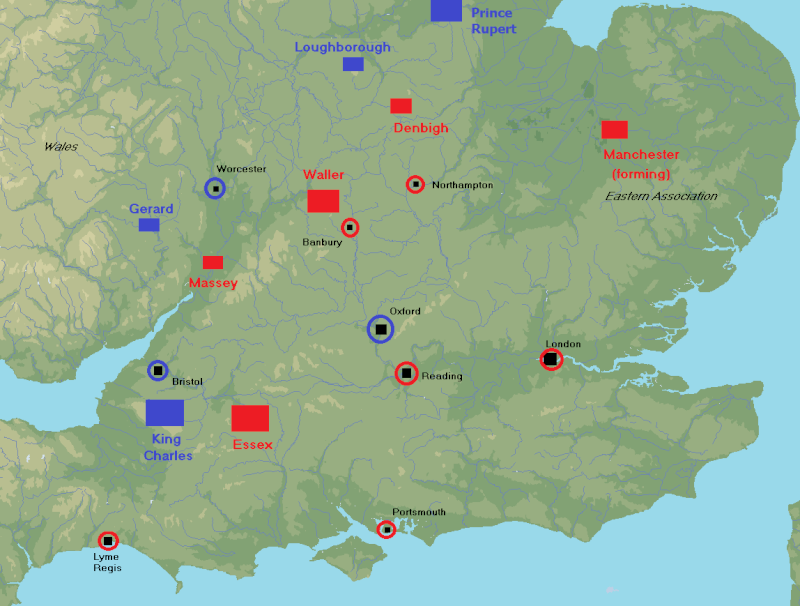 By taking enemy garrisons, the main Parliamentarian armies under Essex and Waller limited the Royalist's opportunity to collect contributions, rather than directly increasing their own war chest. For both sides, troops in garrison can usually exist on what money they find nearby. Marching armies must take money with them however. This is used to pay the men, and to buy food and fodder from local suppliers along the way. Horse cost more than twice as much as foot. If you rest your army at one of your own garrisons, you will spend a lot less, as you can draw on the resources held there for some of your army's needs. There is one specific issue which relates to horse. The demands for fodder from large numbers of horse were a major constraint. Even if money was available, it was very to provide sufficient fodder from more than about 6,000 horse in one place for any length of time. What can I do each week? • Campaign Move your army in order to seek battle, attack enemy garrisons, or to protect any of your own garrisons which may be under threat. You will be expected to lead them, and you will need to spend cash in order to supply and feed them. You may be able to bolster your forces by temporarily drawing support from any nearby regional commander. They will bring some supplies with them, which will last them for a while, but after that will need to be paid. Any such troops you have added to your army will normally return to their garrisons as soon as you move out of that area. • Establish new garrison Occupy an un-garrisoned town. This allows you to control more territory, and potentially raise more taxes. This does cost money when you move to the town, but from then on the garrison will become self-supporting like any other. To protect the new garrison, you will need to strengthen the town defenses. That also costs time and money. • Improve or repair fortifications Strengthen the defenses of one of your garrisons. This will costs lots of money for materials and for feeding and paying the extra labourers you will need to employ. As a guide perhaps £250 for a small town, and much more for a large one. Repairs to damaged existing fortifications may be less. Assume that fortifying a small town will take a week, and a large one even longer. • Evacuate garrison You may wish to do this if you find the garrison is no longer serving any purpose, or is threatened by an enemy army. Or you are short of troops! If they have time, your garrison will slight the defenses and destroy any stores before they leave. This does not cost money, but you may face resistance from the garrison commander and/or his troops, some of whom may be inhabitants of the town! • Raise troops Attract new recruits by beat of drum, and cajoling local dignitaries, at a location you designate. You do not have full control of what you will raise. This partly depends on who turns up, and the attitude of local dignitaries. If you conquer a new area, there is a better chance of finding lots of new recruits there. You will need lots of cash in order to pay the new men an initial bounty, and equip them. As a guide it will cost perhaps £200 per 1,000 foot raised. Horse will cost considerably more, but may occasionally turn up with their own horse and equipment, as they tend to be from the better sort of person. • Rest & train troops This may be a good idea if your army contains a lot of new recruits. Trained men (represented as 'veterans' on the battlefield) fight more effectively. You need to be at one of your garrisons to do this, but it is cost free, as you are drawing supplies from your existing depots. • Launch major raid Small scale raiding between garrisons was endemic, but large scale raids deep into enemy areas were much rarer. But you can send out some of your horse on such a raid, and may get lucky and capture enemy supplies, or even some wagons carrying money. It is potentially risky though, as your horse may be attacked, and they will need to rest for a week following their return before they can be used again. In addition to one of the above actions, you can send as many messages as you like, and also send cash to other players. You can also send a spy to any point within 3 towns of your current position, and hopefully obtain useful intelligence at the end of the week. Spying is a dangerous business however, and you will have to pay the spy (up front) £50 to go on the mission. How do I communicate with other players? Communications between commanders so far apart are problematic. Assuming messages get through, you can assume they will take several days to reach the recipient. You are not therefore guaranteed to get a response by the end of the turn your message is sent. How do I capture enemy garrisons? Troops are often lazy, and their officers less than diligent, so garrisons occasionally fall to a surprise attack. If a garrison is not surprised, it is standard practice to summon it to surrender. If the garrison agrees to hand over the town, it is customary to grant them honours of war. This means they can march off with their arms and colours to another garrison, and they may opt for this, particularly if their defenses are weak. If the garrison remains stout of heart, the normal approach is to blockade the town, and bombard it with any field artillery you have. This may weaken the defenses and or demoralise the garrison. This may or may not be effective, depending partly on how good the fortifications are. It may be necessary to summon siege artillery or miners (who are expensive). But you may have no siege artillery, and there may be no miners locally. In this event, you can still trust to luck and attempt to storm the place. Storming can be a good idea if the defenses are weak and/or the garrison is too small to cover the entire circuit – which is sometimes the case with large towns. You risk heavy casualties however, and your troops will not be happy if ordered to storm frequently. If you have a large force of reasonable quality, marching around the country to seek battle is an option. But remember that battles are always risky, and be aware of how much your campaign is likely to cost. If he is weaker than you, your opponent may seek to avoid your main body and attack your distant garrisons. It is difficult to force an opponent to accept battle, unless perhaps he has a river at his back. You do need to garrison key bases, from which you can control other towns in that area and draw supplies from them (or in Parliament's case, prevent the enemy from doing so). If you can, set up garrisons in places which cut off your opponents from sources of supply. You do not have enough men to garrison every town however. Poorly garrisoned or fortified enemy towns can often be taken quite cheaply. Well-fortified towns will normally need siege artillery to take them quickly. Siege trains are few and far between, but if you can lay your hands on one, it can really speed up sieges. Briefings for Sunday's k/spiel have now gone out to players and umpires. Please let me know if you haven't received yours. I’m dreadfully sorry but we are going to have to postpone tomorrow’s game. The reason is that I’ve gone down with a virus overnight, and am just not up to attending. Have explored the possibility of going ahead with the game anyway with one of my fellow umpires, but for a number of reasons we just don’t think this would work. We are still hoping to run it sometime in the next month or two, if we can get the hall on a suitable date.